What did it take to pass Prop 12 in California this past November, making it “the strongest law in the world protecting farm animals from extreme confinement”? Maybe we start back with Peter Singer’s publication of the book Animal Liberation and the launch of the modern animal rights movement in the United States. Or maybe we look a little later, to the formation of organizations like the Humane Society of The United States and Mercy For Animals who led the ballot initiative last year. Or perhaps we look even later, to the passage of Prop 2 in California ten years prior to Prop 12 (in 2008), a bill which looked great at the time but was later discovered to have some ambiguous language that the industry could take advantage of in court to dodge the basic purpose of the proposition. Wherever we think the success of Prop 12 started, we can see a long chain of hard work and perseverance. Or we could ask the question, what did it take to create the HappyCow app which has been been awarded various flattering titles such as “Best Vegan Online Resource” and been given the “Favorite Vegetarian Website” award from VegNews almost every year since 2006? The founder of HappyCow (Eric Brent) started the site back in 1999, before many of today’s younger vegans were even born. He has said that HappyCow doesn’t make much money and has always been a passion project, something that he believed needed to exist in the world. The widespread success of the website definitely didn’t come overnight. It took years of hard work and figuring out how to overcome the difficulties involved. Or maybe we want to ask how various animal rights organizations were founded and grown, or how documentaries were made, or how laws were passed, or how social media accounts were grown to have so many followers. In every single one of the answers to these questions, we can find at least one thing in common: Grit. The organizations and people involved in successful projects stuck to the same thing for an extended period of time, and they didn’t give up. I want to help as many animals as possible, and I’m sure you do too. That’s why this concept of grit is so important for us—especially since we currently live in an era of instant gratification, clickbait, and endless distraction constantly available at our fingertips. Without grit, you will mostly likely spend your life jumping from one thing to the next. When the going gets tough, you’ll move on to something new. When shiny new things pop up in your life, you’ll put down your current work. And if you continue this way, year after year, distracted and jumping from thing to thing, you’ll build nothing of true, lasting value. With grit, you will learn what it feels like to commit to something and build it through the years. You will see that progress takes time and that hardship can be overcome. And in doing so, you will help more animals. And that’s why we’re all here, isn’t it? perseverance (the ability to continue despite difficulties and setbacks). Believe you can get better, even if you don’t think you’re “good” at something. This is called having a “growth mindset”, and it’s incredibly important. When the going gets tough, keep going. Through #1 and #2, you know you can improve at whatever it is, and you know that perseverance is a predictor of success, so keep going. Passion = long-term focus on the same big thing (we’re talking years, or decades). It doesn’t mean the same exact specific thing, but the main foundation needs to be the same. Perseverance = the ability to stick with something even when it gets difficult, and even when things don’t go as planned. You can take the Grit Scale quiz to see what your current grit score is. Growth Mindset = believing that success is not about being “good” or “talented”, it’s about putting in hard work and getting better every day. Deliberate Practice = identifying the small, individual hard parts about what you do and practicing them until they become easy. Success comes from the ability to break down complex things into a lot of smaller pieces, and then to practice each of the smaller pieces relentlessly until they become habitual. Then, you put all of the smaller pieces back together into one perfectly-executed whole. We often say things like “they’re so talented” or “they’re a genius” or “I’m not good at that.” This reinforces a notion that people are fixed in their abilities and success, when in reality we can all grow and develop at anything. And, in fact, talent is not a great predictor of success in life. We’re all distracted by talent, when in fact long-term focus and perseverance through difficulties (which combine to form grit) are the real predictors of success. Being naturally talented at something helps, of course, but like the saying goes: “hard work will beat talent when talent does not work hard.” Duckworth phrases it as “effort counts twice.” In other words, the amount of effort you put in is what really pays off in the long run. This part of the book has some of the most useful information. You might discover that you’re not currently very gritty, or maybe you just want to be grittier. How can you help grow grit? The good news is that you can grow each of these—they’re not fixed. (In fact, having a “growth mindset” is an important part of improving at just about anything.) In the following sections we’re going to look at these four areas one by one. Does passion affect performance? Research shows that yes, it does. People are much more satisfied at work and they perform better when they do something that fits their personal interests. “Before hard work comes play.” This is where you try a lot of things, discovering what you like and don’t like. You “play” and find your interests. You can’t think your way into discovery. You have to get out there and do things, be involved in the messy process of real-life discovery. You have to take action, continuously, repeatedly. Your initial discovery of a primary interest later in life might go completely unnoticed; it probably won’t be a “eureka!” moment. Experiment a lot. As you spend a lot of time in a single interest, there’s the potential to get bored or feel like you’re anxious for something else. That’s why successful, gritty people are constantly deepening their interest. They learn to see the nuance and complexity in what they’re doing, and they dive deep into it. Where others might see one thing and get bored, they see a million things and are perpetually interested. They constantly find novelty by going deeper. Setting a stretch goal in one very specific and well-defined aspect of what you do, striving to improve weaknesses. Then, focusing completely on achieving that stretch goal, getting as much constant and real-time feedback on how you’re doing, and using that feedback to improve. Finally, after mastery of that stretch goal, starting all over with a new stretch goal in another area of weakness. You know that experience of getting completely absorbed in an activity to the point where you lose track of time? Researcher Mihaly Csikszentmihalyi studied this phenomenon and called it “flow”. Flow is the euphoric feeling of performing at something at a very high-level. You lose track of time, and you’re completely focused and locked in on whatever you’re doing. You’re not aiming for a stretch goal here; you’re performing right at your current level of skill. Deliberate practice is for preparation and training—Flow is for performance. Change the way you experience deliberate practice. It can be painful and hard (unlike flow, which is rather euphoric), but redefine those things for yourself as positive experiences of growth. Angela defines purpose as “the intention to contribute to the well-being of others.” People who perform at very high levels say that their work matters to others, that there’s a higher calling for whatever it is they’re doing. Grittier people have callings, not jobs or careers. The feeling of having a calling leads them to put in more work, harder work, and to stick it out through the tough times. It also leads to higher satisfaction with their work. As activists in the animal rights movement, we are at an advantage here—ending the exploitation of animals is one of the most profound challenges and missions that humanity has ever embarked on. Don’t lose sight of this fact in your day-to-day work. For some reason, that gives me the chills. The first is represented by the quote “tomorrow will be better than today.” This is asking the universe or “fate” to make things better. The second kind is gritty hope: “I resolve to make tomorrow better.” This is us taking charge of our own lives and saying we will make tomorrow better. Learned helplessness: This is when we learn that we can’t control our lives, that our choices don’t affect reality, that we can’t change things. This is incredibly demotivating and leads to less success and more suffering. Alternatively, belief in the ability to change things leads to resilience and less suffering. Control: In order to learn resiliency (and fight learned helplessness), it’s important to try things and then see change—to believe we have control over what’s happening in our lives. Language: The language we use when talking to people (including ourselves) is very important in reinforcing different mindsets. Here are some example phrases that might be used to encourage a fixed mindset (bad): “You’re a natural!” / “You’re so talented!” / “Maybe this just isn’t your strength”. And likewise, some sentences that might encourage a growth mindset (good): “You’re a learner!” / “That didn’t work, so let’s talk about what we can learn from it and how to do better” / “I believe you can do this if you keep trying”. While Part II was all about ways that you can develop grit at the individual level, Part III is about how our environments influence how gritty we become. Good parenting can be both supportive and demanding, where you expect children to work hard and keep trying, but you also show them that you care deeply about them and are there for them. This is called “wise parenting”. (This concept is rather analogous to radical candor.) Supportiveness has two components: being both warm and respectful. Children emulate parents, so it’s also important for the parents to be gritty. And it’s not just parents that play this role for children—this job is also filled by teachers, mentors, siblings, and any other people in a child’s life. Extracurricular activities which are both hard and interesting might have a very positive impact on students, regardless of what the specific activity is, especially when they stick with those activities for more than a year. It’s especially important for coaches and teachers to give feedback (separate from parental feedback), since their role in the child’s life is to help them grow in a specific pursuit. This is contrasted with the difficulty that parents can have sometimes in giving critical feedback due to their other roles, like being emotionally supportive and a more frequent presence in a child’s life. Everyone has to do a hard thing. This thing probably requires daily deliberate practice. You get to pick your hard thing. “Culture is defined by the shared norms and values of a group of people.” The people in the group have a consensus about “how we do things around here and why.” They have an in-group, a distinct culture. One example comes from the early morning practice schedule that swimmers adopt: “When you go to a place where basically everybody you know is getting up at four in the morning to go to practice, that’s just what you do. It’s no big deal. It becomes a habit.” The drive to fit in and conform to a group is very powerful. Attrition model (old model): only those who fear for their survival succeed. Developmental model (new model): same high standards, but instead of being driven by fear people are led from the front. Culture at large organizations can be crafted, but it takes relentless communication: what you say, how you say it, and how often you say it. Verbatim memorization of core cultural principles can help instill those values in people, like how the Seattle Seahawks team memorizes quotes and core values and can explain what they mean. Things of value must be built through trial and error, diligence and learning over the course of many years. Our ability to stick to the same thing over the course of those years will ultimately determine our success at it. To create the biggest impact we can for animals, we need the passion and perseverance to stick with projects long enough to make it through the plentiful difficulties of creating things. Luckily, there are ways of growing our grit, no matter where we start. If you need a place to start, go back to the “Growing Grit from the Inside Out” section, pick one of the four areas to work on, and focus on developing one thing in that area. And together, we can grow a grittier movement. There are two ways to have an idea. The first way, you think of something—maybe an idea for a mobile app to help people go vegan. You spend a week mapping out the full vision for the project: every single thing you could do with it, start to finish. You spend weeks researching the best technology for app development. You think about whether you should build it for iPhones or Android first, and you create a pros and cons list. You talk to developers, designers, funders, anyone and everyone who could help. After six months of planning, talking, and designing, you haven’t even started building the app yet. The world has continued to change and evolve, and you don’t even have a prototype to show for six months’ worth of work. You’re not even sure if anyone will use the app—does it actually help people go vegan? You don’t know. It’s been so long, and you have very little to show for it. You get discouraged, then move on to the next shiny idea that you think of—or you continue slogging through an endless development process for another six months until you maybe release the first version. The second way, you still think of the cool app idea—the beginning is the exact same. You also spend some time thinking about the needs this might solve for people and what the functionality will look like. But then you immediately proceed to the mock-up. 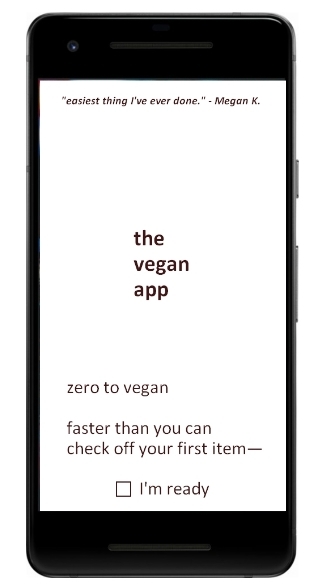 The first screen from my very own vegan app mock-up. As you put your idea down on paper, you’re forced to make real decisions about what your idea could actually look like. This takes you out of the fuzzy, feel-good daydreaming and puts you in decision-making mode right away, which is good because it makes you more action-oriented. With each decision you make about your mock-up, you’re actively creating version 0.01 of your idea. Then, once you’ve got something created that you think represents the basic underlying concepts of your idea, you send your friend a message: “hey, want to grab a drink and test out this app idea I had?” You get together that night and give your friend the sheets of paper. “Pretend this is an app,” you explain, “and walk me through how you’d interact with it.” Your friend laughs because this is a little absurd, and you know it is—but it’s all part of the process. Your friend goes through the paper mock-up and talks to you about how they might use the app. They give you feedback, both positive and negative. You immediately discover at least a dozen things you’ll need to design differently, including a couple major changes. It’s only been a couple of hours, and you’ve already designed your first version of the app and gotten feedback. Tomorrow, you can sketch out a new and improved mock-up and find someone new to test with. After two or three iterations, you’ll have better ideas to run with, and you’ll know what some of the biggest challenges are going to be. You’ve gotten your feet wet, and you can decide if you want to keep going or not. Even if you don’t, you’ve learned something. That’s the value of the mock-up. Rather than try to get everything right all at once and without any testing (like many people attempt), design thinking starts with the user and the problem and then builds up to a solution. We start with the need—what are we trying to solve? We get in the shoes of the person who we’re trying to help (or perhaps in our case, who we’re trying to influence) in order to see things from their perspective. Then we come up with a lot of ideas, prototype the most promising one, and test it out. Then repeat. Just like we did with the app mock-up above. This process can be completed in minutes or hours, rather than weeks or months, and it helps you figure out what you’re actually trying to solve and how to solve it. These questions aren’t easy to answer, and they can’t often be solved just by thinking about it. You have to get out in the world and experience the problem from the viewpoint of your users, your customers. This leads to a very natural question—who are our customers? Whose needs are we trying to solve? So we need to keep the needs of these animals in mind first and foremost. But, these animals can’t interact with us or things we create in the usual marketplaces and institutions that humans use. They’re subject to laws and market forces, but can’t participate in them. When thinking about various aspects of solving their needs, it makes sense to also consider those who can participate in markets and institutions: humans. One need humans have is the need to feel like a good person, to feel like they’re important and making a positive impact in the world. They also need to have harmony between their beliefs about themselves and the actions they take. This need alone can be broken down into many different smaller needs: the need to find alternative products and services, related to food and otherwise; the need to communicate their decisions to their social groups and feel supported in their decisions; the need to make a difference in their local communities by supporting ballot initiatives that end animal exploitation; and so on. Each of these is a need that we can solve. Design thinking can help get us to a good solution, and the mock-up is an integral part of that process. Corporations also have needs: they need to be profitable; they need to have positive public relations; they need to provide value to society; etc. How can we help solve these needs for corporations in a way that also serves our true end customer of exploited animals? And, perhaps somewhat uniquely for social movements, we can create these needs in corporations and individuals where they might not have existed before, in order to solve them in a better way. Someone might argue that they really don’t need to give up eating animals, that it doesn’t cause them any harm—and it’s possible that this is completely true. Remember, the true need here is actually with the animals who are being killed. What do we do in these cases? Well, we have to find a way to translate the animals’ needs into human needs. And we can do that by creating needs in humans that need to be solved in certain ways. For example, let’s say that a corporation confines and kills animals by the millions, and they claim that they don’t need to change that practice. We can foster negative publicity around that company so that their need for positive public relations (which might ultimately be driven by a need for profits) has to be solved by ending their exploitative practices. If an individual feels that they don’t need to stop harming animals in order to be a good person, we can figure out how to introduce cognitive dissonance and create a need to resolve it. This kind of “need transference” is something that has existed in every previous social movement as well, creating needs in the non-exploited population that must be resolved by ending the exploitative practices. Corporate marketers do this all the time, too—creating needs for products that solve “problems” that didn’t exist ten years ago. We can create needs that can only be resolved by ending the farming of animals, ending animal experimentation, etc. We can create a societal need that can only be fulfilled by rewriting the relationship between humans and other animals. To create these needs and then solve them, we can use design thinking. As part of the design thinking process, we can use mock-ups. And to create a mock-up only takes a few minutes—and that’s something you could do right now. So why not do it right now? It doesn’t have to take long, or even be on the computer. Use this as inspiration for how easy it is to create your own mock-ups. Not a perfect article, but it introduces some good concepts to use like: minimum viable product as a process (rather than product); “riskiest assumption test”; etc. We need to accomplish as much change for animals as we can, as quickly as we can, which means we need to make good use of our time. Mock-ups, design thinking, MVPs, etc. are all ideas that focus on doing something to get feedback. Time has shown that the best way to find solutions is through trial and error, over and over and over again. Good ideas don’t come to those who don’t try things. Through taking action and testing our ideas, we can make the best use of our time and figure out what’s going to create the most change for animals. Do you have a narrative for your life and what you’re doing that motivates and empowers you? The Purpose-Driven Life by Rick Warren is towards the top of the best-selling books of all time, at 33 million copies. The main point of the book, if it isn’t obvious from the title, is to help the reader find their purpose for existing and then use that purpose as motivation. The Bible is potentially the best-selling book ever, at an estimated 5 billion copies sold. What does it provide readers? The narrative of why they exist—in fact, it’s a narrative of why everything exists. You could make the case that the core of most religions is the story of who we are, why we’re here, and what to do with our lives—and that, in turn, is partially why religions are such a powerful force in humanity, because they connect so deeply with our need for personal narratives. Further, let’s take a step back for a minute and realize that basically all books, all movies, and almost all forms of media ever are crafted around some kind of story. The news is communicated as a series of stories. Even science textbooks and business books are usually filled with stories or organized into some loose narrative. Humans are storytelling animals. We’re story addicts. We sometimes have a hard time caring about something unless we can weave it into some kind of story. Our movement has many different origin stories, depending on who you talk to. Some might point to Animal Liberation, the now-famous book published by Peter Singer in 1975. Looking back further, you might say that the antivivisection movement starting in the mid-1800s was the beginning of the modern animal rights movement. Or you could even look back much further to ancient civilizations, as Norm Phelps does in his book The Longest Struggle. And regardless of where we started, we can have all kinds of different stories for where we are now, who’s doing what work, etc. These stories of our movement help us understand the pieces and how they connect. And these narratives—these stories of who we are and why we’re doing what we’re doing—are incredibly important for our movement, too. Chances are, you have a story of why you started wanting to help animals. (I talked about my story briefly in Vegan and Back Again.) That’s one of the things that people often tell each other, their “vegan story” or their “activist story”. Those stories are important because they help us explain how we got to where we did—they legitimize the journey and help convey it to others. These vegan stories also represent an opportunity to discover how people changed from point A to point B so that we can help create that journey for others. But in addition to how you got where you are now, what narrative do you have for your current work, and your current journey? What’s your story for where you’re going? If you do work with a group, what’s your group’s story? These stories are important for motivational, inspirational reasons, but they’re also a good way to remain focused as well. If you don’t have a compelling narrative of why you do what you do, then in time you might grow restless or dissatisfied. You might lose track of why you got involved with your work in the first place, and you might think something else is a better use of your time. When we look back at the efforts of others, it’s easy to see that people work for years focused on the same thing in order to create the impact they end up having. Similarly, cohesive narratives are how people are going to remember who you are, and that narrative is going to be how they explain your work to others. Organizations, and entire movements like our own, have the opportunity to create callings for people—reasons so strong for why you do what you do that your work seems to transcend normal activities and exist as part of a greater story. For me and many others, this work is a calling—and I can attest to the motivational power of viewing it that way. People will work for free if there’s an inspiring narrative that they believe they’re a part of. Not only that, but the narrative will help them work better and more cohesively because they’ll know the vision through which to filter their actions. A strong, understandable story can serve as a way for people to take the right actions without having to always rely on asking someone. So if you do work with a group or organization, what narrative are you going to give the work you do together? What’s your story for why all of you are working together? It’s no accident that many people who accomplish a great deal with their lives talk about believing in the vision of what they were doing. Scientists, writers, politicians, and athletes all talk about believing in what they’re doing, doing it for some higher purpose than the thing itself: seeking truth; the love of the subject matter; the need to create; the belief in a better society; the desire to show others the extent of what is possible; etc. To continue the seemingly endless, difficult work we must do, we have to keep our vision—our personal narrative—centered. What is your role in creating a better world for animals? How are you fulfilling that role? If you know your personal narrative and can articulate it, share it with others. Let them know what guides you, what gets you out of bed in the morning, and how your work might intersect with theirs. If we all share our personal narratives with each other, maybe we can find out how to work better together. I’ll start by sharing my own narrative for 2019. Second, I’ll find ways to connect and empower people already on our side. I will connect them with resources, ideas, information, and other people, and I will help them have an even greater impact by working together and by working smarter. I’m currently focusing on improving my ability to execute long-term projects, such as AMP, and thinking about how to bring more people into my life and work in meaningful ways. Although I’m deeply saddened and angered by the realities of why we do this work, I try to practice acceptance of the world as it currently exists (while, of course, trying as hard as I can to change things) and joy in the knowledge that I’m helping create a better version of humanity. One of the biggest areas I have for improvement is in my organizational skills. I’ll be trying to tame the mountain of papers on my desk and the plethora of digital spaces and applications that fill with notes and to-do lists. I’ll try to fix the underlying habits that lead to a cluttered and disorganized life. That’s my story—or at least a very short version of it. What’s yours? Your past story. Write down your story for how you got involved with helping animals. What is the beginning of that story? What are the main turning points along the way? Your current story. Now, write down your story of the work you’re doing now. What are you trying to accomplish, and with who, and why? What’s your vision? (You can also write down your organization or group’s story as well.) Make sure that your story inspires hope within you for your own future. Try to make it something that is exciting for you, that will make you want to get out of bed in the morning. Share your story. Finally, share your story with others and ask them what theirs is. You can write it out and share it online, or you can talk about it with friends and fellow advocates. When you meet someone new in the movement, you can swap stories and see what the overlaps and intersections are. That’s it! See if you can notice a difference in how you approach your work and how motivated you feel when you have a clear and inspiring story in your head for what you’re doing and why. And if you do notice a difference, please share it—I’d love to hear your story. I have a concept I like to call “recovery in motion”. It started out with running. Running is a rather paradoxical thing—it’s basically pure, nonstop physical suffering, but yet there’s nothing else that provides me with such a good feeling and a clear head. And, there’s no freedom quite like being able to go from point A to point B with nothing but your legs to propel you. But basically every time that I run, there’s a point where it would be nice to stop running and just walk for a minute. (Many people would probably agree and say “Yeah, that point is any point that I find myself running.”) Maybe I just finished a fast, sprinty section. Maybe I’m hitting a wall and feel like I don’t have enough energy. Maybe my legs are sore, or I’m tired, or out of breath. Maybe it’s too hot or cold outside. This is where “recovery in motion” comes in. I’ve learned that instead of stopping when my body says stop, I don’t actually have to stop—instead, I can play with the pace at which I run. I can slow down a little, or I can slow down drastically to just a little faster than a walk. I can run more efficiently, trying not to waste energy by bouncing up and down too much or letting my shoes drag on the pavement. I can focus on deep inhales, full exhales. Although I discovered this concept while running, I’ve realized that it applies directly to many other areas of life, especially those areas where endurance in the long run is what counts—such as our work for animals. Like many other people, I go through cycles of working extremely hard and then feeling rather burned out. “This problem is so big,” I think, “that I need to completely ignore everything else in my life, including my own health, to keep working.” It only takes a few weeks or months of this kind of pace before things deteriorate quickly. Your emotional resiliency fades, and you find yourself unable to control your anger or sadness. Your mind is slow and fuzzy. You’re tired, irritable. The quality of your work decreases, or you work increasingly on irrelevant matters. At the point where your mind and body are telling you “stop”, you have two options: You can quit, or you can recover in motion. Quitting is saying, “You know what, this is too much. I’m going to put this down and I don’t know if I’ll come back to it. I’m going to focus on other things—maybe nothing at all.” It’s stopping, with no plan to start again. Recovery in motion is all about sustainable pushing and resting habits. You can push yourself hard—and I think challenging ourselves is great—but then you need to know how to back off and let yourself breathe for a minute. You can focus simply on putting one foot in front of the other, on keeping yourself moving forward while you rest. Not only that, but each time you do this cycle of pushing and recovering, you learn a little more about how hard you can push. You actually grow your capacity to push harder the next time and to have a better sense of where your limits are. One last note. There’s a lot of talk about sustainable activism in our movement these days, thanks in large part to the efforts of In Defense of Animals and their Sustainable Activism campaign, and I believe this focus is very needed. Make sure to take care of yourself and find resources to help if needed.